The NY Times reports that the Feds are launching a new campaign to help educate kids about advertising. 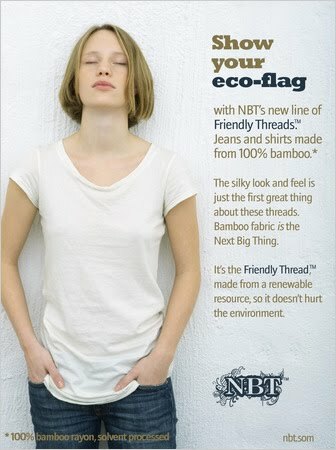 A sample ad is at the left, for eco-friendly jeans made by an imaginary company. This ad and others are similar to those used to target kids, and I guess all of us. As noted in the Times article, the government enlisted the aid of Scholastic, the educational publishing company and Fleishman-Hillard to create the ads, a website and game to help kids decode ad messages and "become critical thinkers." Over the years I've spent a lot of time crafting messages for persuasive media, political campaigns and issue ads. So I've learned first hand how powerful a medium video can be to deliver those messages. And while kids are certainly a lot more media savvy in some ways, they and all of us are susceptible to the subtle messages so often embedded in advertising. We're so used to them, they don't even register in our consciousness. As the lines have become blurred between fact and fiction, news and advertisements, political rhetoric and reality, etc. the ability to think critically is more important than ever. Nobody likes to be manipulated. So I'm glad that we're making an effort to help kids understand the motives and messages behind the message.